The Tar Sands Campaign Against the Overseas Export of Canadian Oil: Activism or Economic Sabotage? For excerpts of the full report, click here: The Tar Sands Campaign Against Overseas Exports of Canadian Oil: Activism or Economic Sabotage? On the basis of the evidence presented in this report, it is clear that The Northern Gateway pipeline and other proposed pipelines for the overseas export of oil from western Canada have been deliberately sabotaged as part of a multi-million dollar, U.S.-funded effort referred to as "The Tar Sands Campaign." This effort aims to stop the export of oil from western Canada by pipeline, tanker and by rail. The absence of a successful response to anti-pipeline activism and other factors also contributed to pipeline project cancellations. 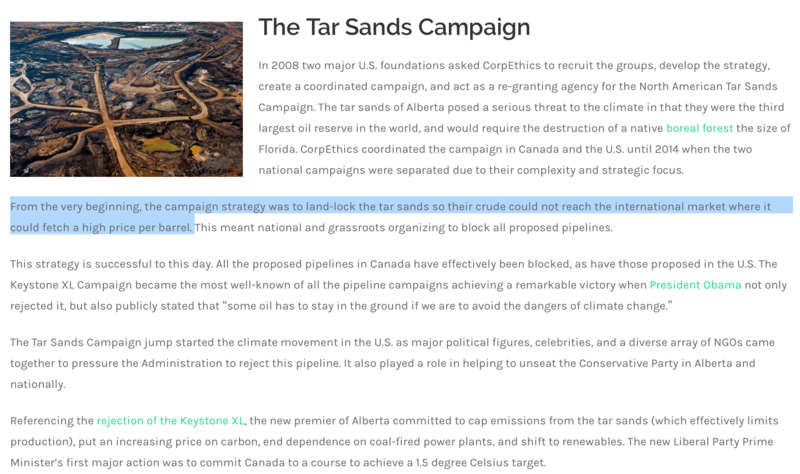 When the American funding behind The Tar Sands Campaign first came to light in 2010, the strategy of the U.S. funders was not entirely clear. But now it is. In the words of the original director of The Tar Sands Campaign, from the very beginning the strategy was to "land-lock" oil from western Canada within North America so that it could not reach overseas markets where it could attain a higher price per barrel. The Tides Foundation alone has made more than 400 payments totalling $40 million to 100 organizations involved in The Tar Sands Campaign. Over the years, The Tar Sands Campaign has broadened from environmental activism to elections activism. 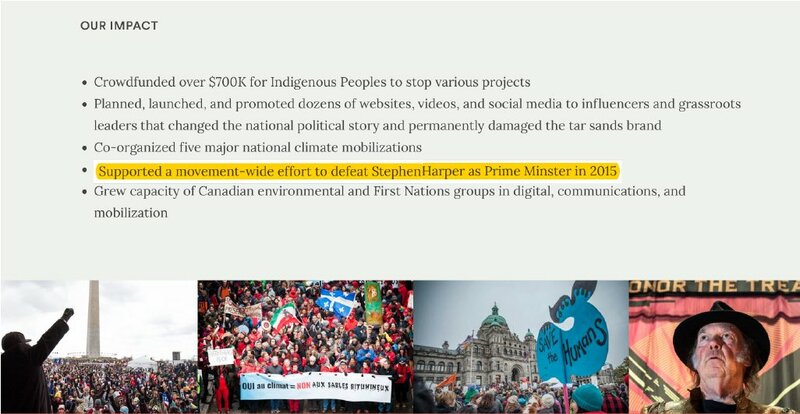 After Canada's 2015 federal election, The Tar Sands Campaign organizers claimed credit for helping to defeat the Conservative Party of Canada. Among the Canadian participants, two of the most heavily funded organizations are Leadnow and The Dogwood Initiative. Both are active in municipal, provincial and federal elections, especially in British Columbia. What this means is that one of the factors in Canadian elections at all levels of government is a multi-million dollar effort that continues the U.S. monopoly on Canadian oil exports, keeping Canada over a barrel. Election Activism: The Dogwood Initiative, Who Is It and Who Funds It?